Make it comfortable for you, join us on an all inclusive guided kayak tour. 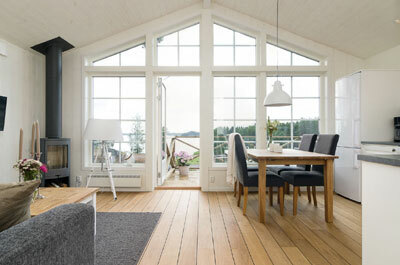 The St. Anna archipelago is considered by many kayakers to be Sweden's best, most beautiful and peacefull area for outdoor living in summertime. Now it is your turn to discover Kayak Paradise! We have many alternative routes, which means that we can choose our route taking account weather and the wishes of the participants. 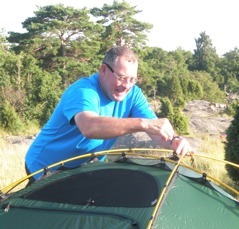 During our tour we will primarily paddle in the outer archipelago and camp in 2 persons tent. The area teems with perfect islands so we can promise memorable favorite places for outdoor camping and dinner with guaranteed ocean view. We will focus on getting a paddling technique that is functional so that everyone can go on a winning way, yet energy efficient. 3 relaxing days, paddling and outdoor life with time for swimming and sunbathing awaits you on our guided kayak tour in fabulous St. Anna. The guides put a lot of love in cooking for you. The first evening, great archipelago buffet of local fish products. The second day is a Greek-inspired barbecue evening who awaits you on a faraway island with smooth flushed cliffs. 3-day kayak tour for your private group. Choose the days you want and we can see if we have available kayaks and guides. Fall in love with the St Anna and Gryt idyllic summer archipelago under a four days tour. An archipelago of small shallow passages, a multitude of islands, combined with an open sea with a free horizon just for us kayakers. A lovely mix of wild nature areas and inhabited islands with tourist services is what awaits you. 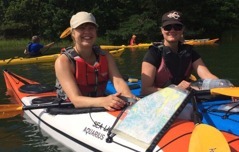 Our 4-day kayak trip is aimed primarily to those who want to paddle much, although not perhaps as fast but relatively many hours per day will be in the kayak. We will focus on getting a paddling technique that is functional so that everyone can go on a winning way. Longing to take it really easy on your kayaking trip, we recommend our 3 day tour. 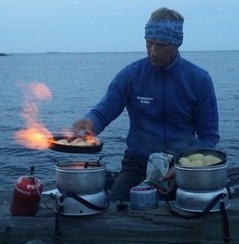 We put a lot of love in the outdoor cooking, delicious dinners every day and absolutely no freeze-dried accepted by the guide in charge of the food. Lovely breakfast, tasty lunches and lots coffee/tea breaks we enjoy during our kayak tour. 4-day kayak tour for your private group. The kayak tour price includes: English speaking kayak guide/intsructor, fully equipped kayak, waterproof bags, two person dome tent, Exped mattress, summer sleeping bag and comfortable outdoor chair. That what you need to bring is your personal items. Summer outdoor clothes and hygiene gadgets and also a "favorite drink" for the evening if you wish you can bring with you in the kayak. Terms: Swimming ability is required. You should be in good health, have a normal level of fitness and enjoy the outdoors. With single kayak is required to have paddled a sea kayak before in different wind conditions. For beginners it's always working fine with double kayak on our guided archipelago tour. Minimum age for participation is 12 years. When booking a kayak tour you will get an e-invoice of 50% of the amount. The rest you pay on the spot (by card)or alternatively already in advance by bank transfer. We do not make reservations for indoor accommodation for you. Info and Booking can be made by email or phone or use the form.